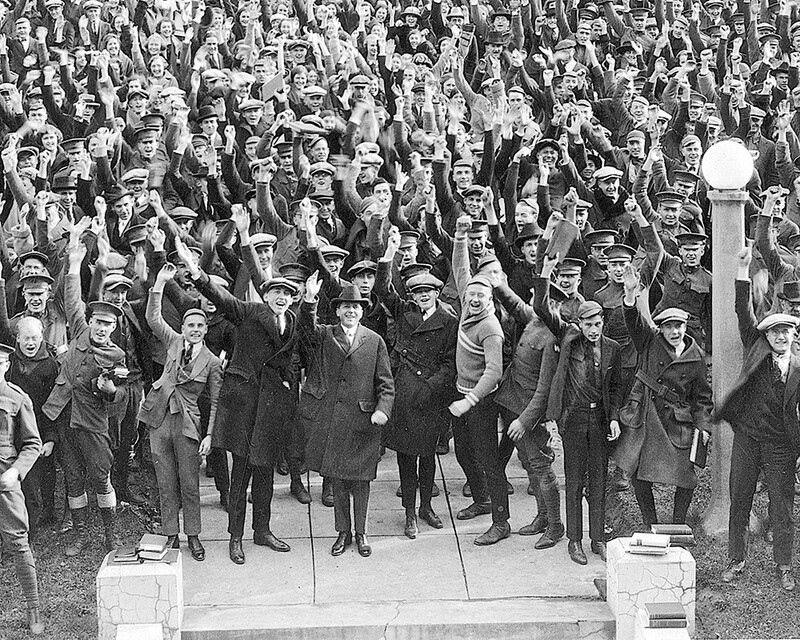 President Ernest Holland (center, in the fedora) celebrates with the Washington State College graduating class of 1922. Right about now, Dr. Kirk Schulz, who was just appointed the next president of Washington State University, may be looking around for ideas. If so, my advice would be to look way back — a century, in fact — and check out the approach of one of his distinguished predecessors, Dr. Ernest O. Holland, who became president of Washington State College exactly 100 years ago, in 1916. Holland's idea of education was not about job training. Given their own ambitions and a competent faculty, students would learn that. Holland's aim as president was to ensure that the next generation was equipped to take over the controls of society. At Columbia University, Holland had been a student of famous teacher and philosopher John Dewey, who taught that minding one's own business was not sufficient to living a good life for the simple reason that others often will not mind their own business. Dewey pointed out that, like it or not, we are all inextricably bound together. Dr. Holland prepared students for that world by operating a virtual academy of democracy down on the Palouse. Freshmen might arrive full of themselves and free of their parents, but then they met the sophomore class. The job of sophomores was to bring freshmen to heel. Of course, freshmen rebelled, but in doing so they welded together into a cohort of lifelong friendships. It was one of the ways students learned. The WSC campus had a political structure, designed and organized completely by students, which pitted a Fraternity Party against the Residence Hall Party. Every spring, the college erupted into a lively struggle of huge rallies and hilarious speeches. Both sides pushed their constituents hard to do their civic duty. In fact, students became better than the larger society at turning out the vote. In the student election of 1941, 82 percent of students cast ballots. The Fraternity Party candidate president won by just six votes. Holland himself exemplified the quality he most valued in students, which was civility. He attended their meetings and listened. He invited small groups to the presidential mansion, not to tell them something, but to hear what they were thinking. One student, Lylia Appel Miller, class of 1929, recalled meeting Dr. Holland for the first time. They almost collided at the library door. Dr. Holland said, "Pardon me, Lylia!" He knew her name! She was so impressed, she started listening closely to his regular talks to the assembled student body. A half-century later, she wrote an article for a newspaper saying that Holland, though he didn't lead a class, was her most influential teacher. President Holland gave his last formal speech in May of 1942. (He retired in 1944.) In the speech, Holland quoted a letter sent by a German youth to an American friend. The German boy declared, "Germany is the most powerful state in the world, with the best army, the best leader, the best government, the best idea. No country in the world will be able to defeat us." That kind of blind faith, Holland said, was achieved by "contemptible, tyrannous means" of propaganda and terror. Yet, he said, "Something of the spirit itself, rightly fostered and rightly directed, is essential to the life of a great nation." By "spirit" he meant civic spirit that leads citizens to lend a hand in a larger cause. He said he just hoped that American youth had that quality. Holland needn't have worried. He could hear for himself that one of his graduates, Edward R. Murrow, broadcasting from London, had already become a leading voice in defiance of the Axis powers. Holland learned soon after the speech that yet another WSC student, Ross Greening, was one of the pilots who volunteered to fly deep into Japanese-controlled territory to bomb Tokyo in March of that year in the famous "Doolittle Raid." Later, Greening volunteered for the European theater and had led 27 missions over Italy when he was shot down and eventually captured. When he arrived at a prisoner-of-war camp, Greening was astonished to look up and see Loren G. "Mac" McCollom of Ritzville. They were fraternity roommates at Washington State. While Greening was attacking the Germans from bases in Africa, McCollom was leading a fighter squadron attack from England. Two Theta Chi roommates, it turned out, had Germany surrounded. In the 1990s, a Harvard political scientist named Robert Putnam made an elaborate study of the changes in civic behavior over generations. He found that young people who came to maturity just before World War II were more likely to vote, to donate, to volunteer and to serve. Putnam dubbed this group "The Long Civic Generation." Differences in education were the big predictor of civic behavior, he found; by far the most active civically were college graduates. William Stimson is a professor of journalism at Eastern Washington University and author of Instilling Spirit: Students and Citizenship at Washington State, 1892-1942 (WSU Books, 2015). He'll be talking about his new book at Auntie's on Friday, May 27, at 7 pm.